Grave violations of the Kurdish community’s rights to political participation and freedom of expression are seriously undermining all hope for true democracy and lasting peace in Turkey, says Minority Rights Group International (MRG). On 16 August 2016, the pro-Kurdish daily newspaper Ozgur Gundem was shut down following a court order for spreading ‘terrorist propaganda.’ The newspaper’s office was seized by the security forces and several journalists were detained. Twenty-two of them were released on 18 August and some declared that they had been ill-treated during police custody. On 11 August 2016, the Istanbul office of the pro-Kurdish People’s Democracy Party (HDP) was raided by the police. The raid on the HDP’s Istanbul office came hours after twin bomb attacks in the mainly Kurdish southeast, attributed by the security forces to the Kurdistan Workers’ Party (PKK). According to Doğan Erbaş, co-head of HDP Istanbul, contrary to the law, no members of HDP were asked to be present during the police raid, nor were they informed of the reasons for the operation, during which office furniture and equipment was damaged and computer hard drives were confiscated. Seventeen official members and volunteers of the HDP Istanbul office were detained on the same night. The declaration of a state of emergency throughout Turkey on 20 July following the failed coup attempt on 15 July, the lifting of parliamentary immunity from prosecution for HDP lawmakers and other MPs in May, and an indictment which accuses HDP’s head, and his deputy, of publicly praising the PKK and its jailed leader Abdullah Ocalan, are also all causes for serious concern, says MRG. The southeast of the country has seen some of the most intense fighting since the 1990s, after a ceasefire between the Turkish state and the PKK collapsed in July 2015. In many towns mostly populated by Kurds, such as Şırnak, Cizre, Sur and Nusaybin, houses have been demolished, curfews are in force and hundreds of thousands of people have been displaced. The area saw further bloodshed on 18 August with bomb blasts killing at least ten people and wounding hundreds. Turkey rose 19 places in MRG’s Peoples under Threat 2016 survey, which ranks countries where communities are most under threat of mass killing or genocide. 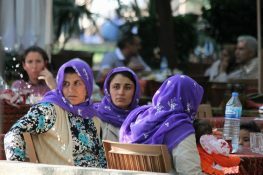 Photo: Kurdish women in Turkey. Credit: Charles Roffey.